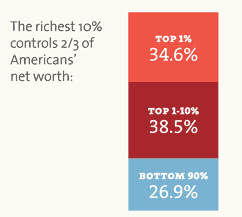 On the surface, the 1% appear to be riding high, economically and politically speaking. Riding roughshod might be a more apt description. They have been positively cleaning up in very recent times. Closer inspection shows signs of desperation in high places, however. Say what you will about them, but the 1% can read the handwriting on the wall. They can see the changing face of America and its implications for political power. And they can see this change will only accelerate in the foreseeable future. They can see generational change coming, too. Many if not most Americans seem disinclined to turn on them, but not so with the so-called Millennials. The teens and twenty-somethings are downright disenchanted with corporate America. While older generations remain largely sold on capitalism, Pew Research shows the Millennials actually prefer socialism. Grim job prospects and a downsized American Dream buried under a mountain of student debt will do that. Democracy, with its core emphasis on majority rule, is fundamentally numerical. With fast-changing demographics and generational angst working against them, the 1% are confronted with a political landscape where it will be increasingly difficult for them to numerically hold on to their privileged status as America's ruling class. Desperate times yield extreme measures. A future marked with growing inability to win numerically explains why the 1% devote so much energy to rigging the political game procedurally and financially. America's changing face and shifting political terrain explain the recent surge in voter suppression efforts. Which, in turn, goes a long way toward explaining mass incarceration. That handwriting on the wall the 1% are reading explains why we're seeing the most brazen manipulation of political boundaries through partisan gerrymandering in living memory. It explains why they needed an obliging Supreme Court to rule as it did in the Citizens United case. And it explains why Citizens United is not enough. They now need the court to go even farther on their behalf, and there's good reason to believe they will be obliged once again. Emerging demographic and generational realities are creating political conditions under which maintenance of the 1%'s iron grip on power is incompatible with democracy. That's why democracy is under such vicious assault. Your scenario here leaves out a very important element of our daily life already, and an exceedingly/increasingly heavy-hitting force in the likely future - Surveillance. If you meditate on that for any length of time at all, the only intelligent thing to do is to re-write your last sentence. Panopticon surveillance puts a pretty heavy finger on the scales of (so-called) justice in the favor of the 1%. I have no clue - none what-so-ever, where you get that "they're going down" idea. Hun, they're gearing up.